Martha Whitmer, ca. 1900. Family photo. 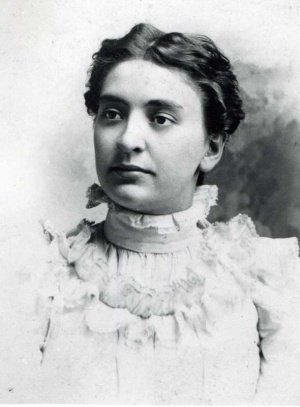 Martha Whitmer Steiner, teacher, minister's spouse and women's missionary society organizer; born 10 November 1878 on the family farm south of North Lima, Mahoning County, Ohio to David Lehman Whitmer (21 February 1838-7 May 1926) and Anna Otto Whitmer (2 August 1843-23 October 1911). She was the third child in a family of two sons and two daughters. She was essentially a youngest child, as her younger brother died in infancy. Her older brother, Paul Whitmer, became a professor and dean both at Goshen College and Bluffton College. Martha married Albert "A. J." Steiner (30 October 1876-20 August 1965) on 19 March 1904; they had three sons, David, James and John. Martha died of cancer on 12 September 1928. David Whitmer came from a conservative Mennonite family, but was not conservative himself. He voted in local and national elections throughout his life, and did not believe the dress restrictions coming into the Mennonite Church were appropriate. Anna Otto Whitmer grew up in the Reformed Church, and did not join the Mennonite Church until several years after marriage, when the local Mennonite community experienced a division led by Jacob Wisler. Anna persuaded her husband to stay with the English-speaking side of the division, though his brothers all joined the Old Order Mennonites. Martha Whitmer's home thus had a progressive orientation that was greatly enhanced by a library of several hundred volumes of classical literature and history bequeathed to the family by a relative. Martha was the first Mennonite young woman in the community to graduate from high school, and after taking several months of normal school, she became a public school teacher at age 16. She continued to teach for nine years until her marriage. The 1910s in the Mennonite Church brought heightened interest in the formation of local women's missionary societies. Although societies had begun to form even prior to 1900, many local sewing circles formed to sew garments for the poor and for mission workers, and to raise money in support of mission workers. During World War I some emphasis shifted to overseas relief. A key leader in forming regional, and then a denomination-wide Mennonite Woman's Missionary Society was Clara Eby Steiner, Martha Whitmer Steiner's sister-in-law and widow of M. S. Steiner. Clara asked Martha to form a local society in the three Mennonite churches that formed one congregation in Mahoning and Columbiana counties. She also wondered if Martha might also lead a state-wide women's organization. Martha was eager to become involved, and organized and led a local society in April 1918. She then organized a statewide meeting in conjunction with the August 1918 meeting of the Ohio Mennonite Sunday School Conference. Martha Steiner was elected as the chair of the new statewide group, and served in that capacity until her death. Within its first year the Ohio Women's and Girl's Missionary Society raised over $3200, and planned to sponsor two missionaries to India, and to provide $100/month for Florence Cooprider's medical clinic in India. The following year the annual meeting of the Ohio Society was then changed to link with the Ohio Mennonite Mission Board, then chaired by her husband, A. J. Steiner. It soon became clear the denomination's Mennonite Board of Missions and Charities was not interested in missionaries being appointed by the women's organizations when it rejected the first candidate proposed by the Ohio Society. Martha also learned that some key bishops, who she had hosted in her home, privately spoke negatively about "this women's organization." Escalating conflicts between the Mennonite Woman's Missionary Society and the Mission Board took its toll. Clara Eby Steiner resigned her role as General Secretary in the denomination-wide Society in 1926. Her health was suffering, and she also wondered if she had lost authority because of the expulsion of her congregation, Zion Mennonite, from the Ohio and Eastern A. M. Conference in 1924. In May 1926 Martha Whitmer Steiner became General Secretary of the Mennonite Woman's Missionary Society, two months after the Mennonite Board of Missions and Charities appointed its own women's committee "to have charge of the distribution of the Sewing Circle work for the different mission stations...."
The existence of two committees led to confusion within the local societies. In August 1927 three bishops representing the Mennonite Board of Missions met in Martha Steiner's home with four women from the Woman's Missionary Society executive, and negotiated to transfer "the further planning and work of this society over to the General Mission Board or such persons as they see fit to sponsor it." The women willingly surrendered their organization in order to ensure the long term survival of the local and regional societies, though they were bitterly disappointed. The Mennonite Woman's Missionary Society tried to wind down its activities in March 1928, but continued for another year to facilitate the transfer to the new structure, but Martha Steiner had died before this final transfer was completed. Already in 1926 Martha Steiner's health began to fail. She underwent surgery in February 1927, and improved for time, but was anointed in February 1928 as her health worsened. She was unable to attend the state meeting of the women's organization in August 1928 for the first time, and died on 12 September 1928. Over 700 persons attended her funeral at the Midway Mennonite Church, where she is buried. Martha Whitmer Steiner stood firmly in the "progressive" wing of the Mennonite Church at a time it was shifting in a more conservative direction. She frequently vented her unvarnished views in letters to her sister-in-law, Clara Eby Steiner. When Goshen College closed for a year, she wondered if Mennonite young people might do better in Quaker or Church of the Brethren colleges. When her brother, Paul Whitmer, and his congregation were expelled from the conference, she said if he wasn't good enough for the church, she wasn't either, though she took no steps to withdraw her membership. During her lifetime her more liberal views influenced those of her more cautious husband, A. J. Steiner, and they appeared to be a good team. Despite Martha Steiner's frustrations with her denomination, her commitment to its programs and larger mission never wavered. Gingerich, Melvin. "The Mennonite Woman's Missionary Society: II." Mennonite Quarterly Review 37 (July 1963): 214-233. Klingelsmith, Sharon. "Women in the Mennonite Church, 1900-1930." Mennonite Quarterly Review 54 (July 1980): 163-207. Steiner, Sam. "The Middle Ground: a Biography of A. J. Steiner in the context of the Ohio Mennonite and Eastern A. M. Joint Conference." Unpublished paper, 1982. Copies available at Mennonite Historical Library, Goshen, Indiana and Conrad Grebel University College Library, Waterloo, Ontario. Whitmer, Paul. "The Autobiography of Paul Whitmer." Typescript, 1952. Copies available at various Mennonite Historical Libraries. Steiner, Sam. "Steiner, Martha Whitmer (1878-1928)." Global Anabaptist Mennonite Encyclopedia Online. January 2011. Web. 19 Apr 2019. http://gameo.org/index.php?title=Steiner,_Martha_Whitmer_(1878-1928)&oldid=143754. Steiner, Sam. (January 2011). Steiner, Martha Whitmer (1878-1928). Global Anabaptist Mennonite Encyclopedia Online. Retrieved 19 April 2019, from http://gameo.org/index.php?title=Steiner,_Martha_Whitmer_(1878-1928)&oldid=143754. This page was last modified on 15 January 2017, at 23:10.